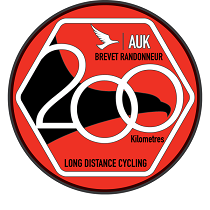 200km cycling event starting from Churchend,Dunmow, Essex. Controls at Orchard Tea Gardens, Grantchester, Maglia Rosso Cafe, Hawstead and Manningtree, plus 2 information controls. The same route as recent years, two good caf� controls, lots of quiet, scenic lanes in Essex, Cambridgeshire and Suffolk. Breakfast at the start, refreshments at Manningtree and the finish included in the entry fee. If there is sufficient demand, riders may sleepover at the hall on Friday night. Contact the organiser to book some floor space.